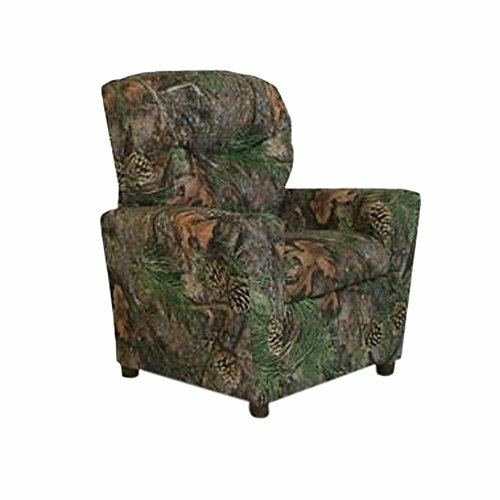 This Camouflage Child Recliner Chair With Cup Holder won't stay hidden from your favorite lounger. It is guaranteed to make a statement in any living room or playroom. This high-quality recliner comes in Kid-durable Cotton Camouflage which makes cleaning up crumbled cookie crumbs a snap. Spoil someone you love in a snap. Bring home the Camouflage Child Theater Recliner today. Recommended for children ages 2 to 9. Weight 32 lbs. Dimensions: 27" high x 24" deep x 24" wide.